It’s always a tough one, deciding whether or not to write about bars and restaurants we visit when we’re elsewhere in Turkey. Nice to offer tips to you, should you go to that place, but the reality is, any of these eateries and watering holes could close down and we’d have no idea about it. Places to eat and drink in Antalya is a pretty safe one, however. We’re in the city at least once a year so we can keep ourselves up to date – and places like Dubh Linn Irish Pub in Kaleiçi deserve to be written about. You know we love to wander the maze of streets that is Kaleiçi and this is the area where we always stay, too (most recently, we stayed at 1207 Boutique Hotel). Aside from the fact that its cobbled historic alleyways are achingly pretty and full of surprises, over recent years, the Antalya youth, twenty and thirty somethings, have made this area their daytime and evening playground. Dubh Linn Irish Pub is just one of numerous places to park yourself and watch the world go by. It’s also in a really central part of the old city so it has a constant stream of customers. The photo above doesn’t tell that story, of course. That was taken on an early morning stroll, last year. Dubh Linn Irish Pub was yet to wake up and open its doors for the day. But when those doors do open, well, we’ve found ourselves there numerous times over the last couple of years. As do many other wanderers, too. 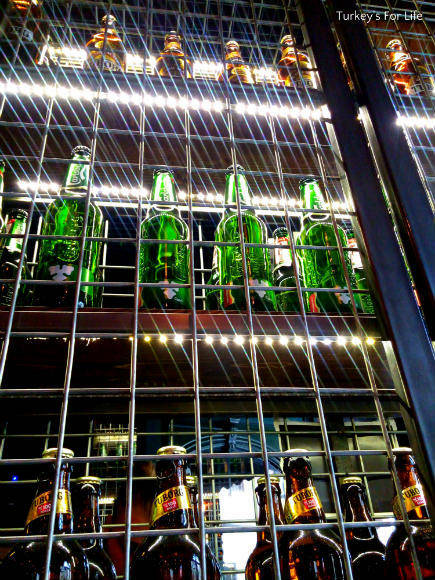 Inside or outside, it’s a lively, busy atmosphere. Don’t get us wrong; we’re not the type of people who go hunting out Irish pubs wherever we travel. For us, Dubh Linn just happens to be an Irish pub. We just like to be there. They play Irish music, they serve Guinness and they have Celtic imagery on the walls – and then, after all that, it’s simply a great pub! Why? The staff at Dubh Linn Irish Pub are great and it’s been some of the same team over the last couple of years. A good sign as far as we’re concerned. They work so hard and no matter how crowded the tables become, attracting the attention of the waiter for your next beer or to ask for a menu is never difficult. And they’re young, so, more often than not, they’ll run to you! No slouching around in this establishment; it’s full of energy. Sometimes, you don’t need to to go to the effort of attracting their attention. Each drink is served with Doritos and – not to everyone’s taste but Barry and I fight over them – sliced pickled gherkins. It didn’t go unnoticed that we were very appreciative of the little gherkin extras so we were often topped up without asking on our most recent visits. A win-win, really. We got our salty pickled gherkin fix = we stayed around for one or two more beers than we might ordinarily have done. Dubh Linn Irish Pub is actually also called a gastro pub. This is no insult to Dubh Linn Irish Pub – it might even be a compliment – but ‘gastro pub’ is perhaps not the label we’d use. The food’s great – but it’s what we’d call good pub grub. If you’re sat with friends having a few drinks and you get hungry, it’s the type of food that’s gonna sort you out. Post-marathon and 10k run in Runatolia, we were indeed sat with friends at Dubh Linn enjoying some deserved cold beers and chats. When menu time came along, pizzas and burgers were ordered. 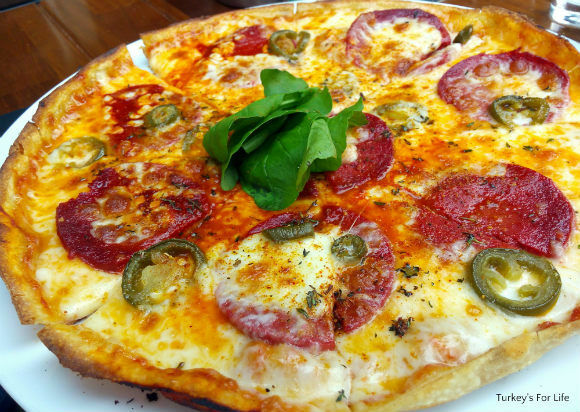 Above is the sucuk pizza – we love sucuk – with extra added jalepeno chillies, of course. And prices are reasonable. And if beer and Guinness is not your thing, cocktails, shorts, various coffees and soft drinks are all on the menu, too. Great staff, chilled and friendly atmosphere, good pub grub and a decent beer selection means Dubh Linn Irish Pub in Kaleiçi looks like this on a late winter / early spring afternoon (see above photo). Sometimes, you’re struggling to get a table! We’re looking forward to our next visit next time we’re in the city of Antalya. Dubh Linn Irish Pub is on Hesapçı Sokak in Kaleiçi, Antalya. It’s easy to spot, just past the broken minaret – Kesik Minare – so it makes a good meeting point if you are with a group of friends all staying in different places. Dubh Linn Irish Pub are on Facebook and Instagram. Dubh Linn is one of the many Antalya bars and restaurants we love to visit when we’re in the city.